Let's Be Mermaids ! Great coastal Mermaid pillow. 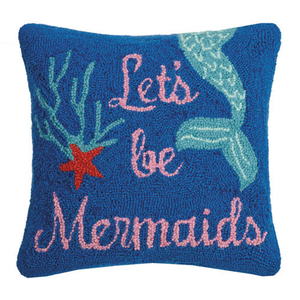 Why not add this pillow to your coastal vacation home. Accent your sofa, chair or that relaxing get away spot. Hook Pillow measures 16" X 16". Hidden zipper enclosure completes this fun beachy cushion. Wool and Cotton Hooked Pillow with Poly Insert . Toss this throw pillow with other matching coastal theme pillows.